At the Vamp HQ in Amsterdam we get to talk to a lot of Docker, DC/OS and Kubernetes users. For us, as a startup in this corner of the tech space, talking to the engineers and architects behind some pretty serious container based cloud environments is of course worth the proverbial gold. It’s also a lot of fun to just help people out. They have a Mesosphere DC/OS environment up and running. They have a CI/CD pipeline to deliver and deploy application builds. 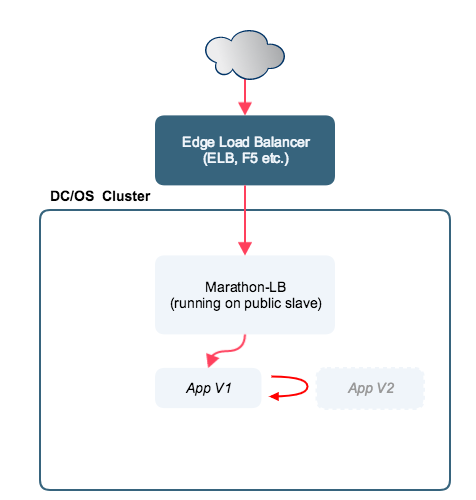 They are using the pre-packaged Marathon-LB to handle routing and load balancing. Option 2: Use Vamp’s gateway functionality in isolation, augmenting and leveraging your current Marathon-LB setup. This allows you to use Vamp’s powerful weight and condition based routing with minimal changes in your current environment. 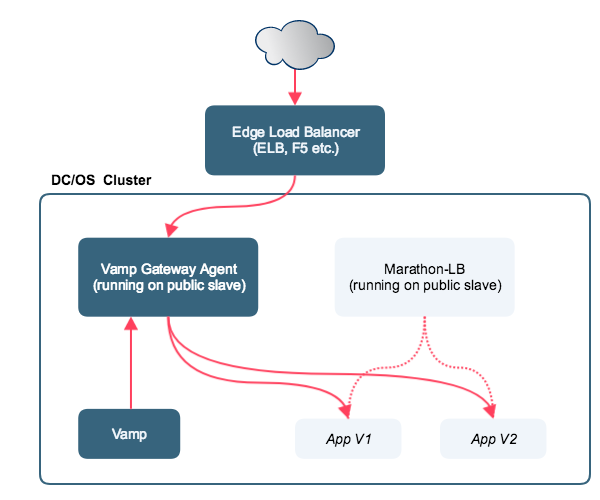 Under the hood, Marathon-LB and Vamp gateways both use HAproxy for routing. To get up and running, let’s take the following architecture diagram as a starting point. An edge load balancer routing traffic to Marathon-LB where Marathon-LB is installed on a public slave in a DC/OS cluster. Marathon-LB fronting one version of one app. By setting the HAPROXY_0_VHOST in the labels, we are ALSO binding this app to port 80 under the VHOST name simpleservice100.mycompany.com . This means — if our edge load balancer and possible intermediary firewalls are configured to allow this traffic — we could add a CNAME record to our public DNS with that VHOST name and point it to the public IP address of our edge load balancer to expose the app on the public internet. Strictly speaking, we don’t need this for our scenario, but it can be very convenient to be able to access a specific version of our app using a descriptive name: you could also choose to use something like service.blue.mycompany.com and service.green.mycompany.com in two app deployments that respectively are two version of the same service. This way, you always have a lot of control on what version you are accessing for debugging purposes. One or more Vamp Gateway Agents (VGA’s), also living on the public slave(s). Vamp can install this automatically on boot, but if you want to take control yourself, you can easily use this marathon json file as a starting point and deploy it yourself. The resulting architecture will be as follows. 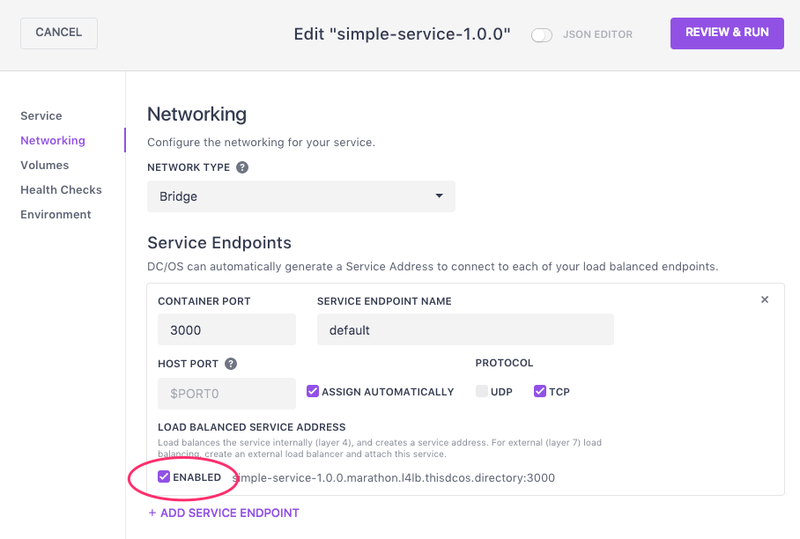 Notice, that we now use the Vamp managed Vamp Gateway Agent as the ingress point for our edge load balancer and let the VGA route traffic to our apps. This means the VGA now hosts your public **service endpoint **regardless of the version of the service you are running. Clients using this service or app should use the address and port as configured in the VGA. Having said that, we didn’t change anything to how Marathon-LB exposes endpoints. Next to the new VGA →Apps routing scheme, you can just keep using any existing routing directly into Marathon-LB. However, from now on you will have to deploy any new version of your service as a separate and distinct deployment and not as a replacement / rolling-deploy of an existing older version. Each deploy then gets a load balanced address based on the version number or some other naming scheme you come up with to distinguish which version is which. You could easily have your CI pipeline generate names based on GIT hashes or semantic version numbers as shown below in the abbreviated example. The Vamp artefact to create this is just this seven line piece of YAML where we have already split the traffic using the weights option. We post this YAML either to the Vamp API or just copy & paste it in the UI. You can see we just redirect traffic to the layer 4 addresses. 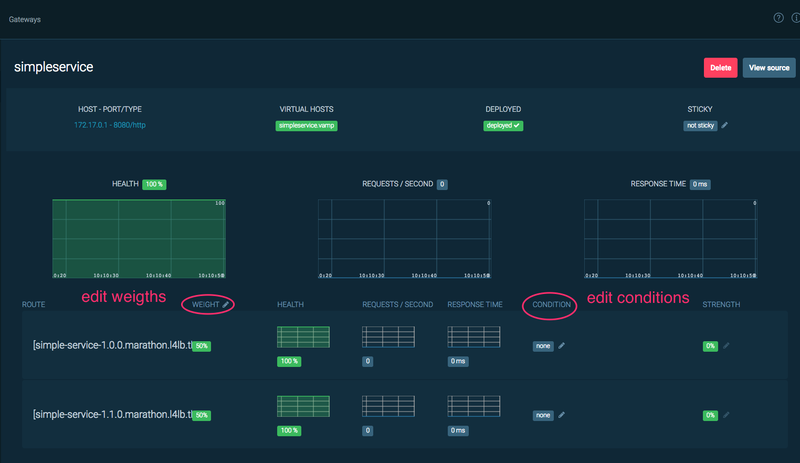 If you fire up the Vamp UI you can start manipulating traffic and executing canary release and blue/green release patterns using all of the functionality available in full Vamp installations. Alternatively, you can use the Vamp CLI to directly integrate these patterns into bash scripts or CI pipelines. Because we are still deploying to Marathon outside of the Vamp orchestrator, the VGA does not “know” when a service is 100% deployed, booted and ready for traffic. This means we should be careful about sending traffic to new services directly after deploy: the might need some time to actually start answering requests. Congratulations! You’ve just added powerful routing to your DC/OS cluster. Vamp comes with a lot of other goodies, but this first step is an easy way to get to know Vamp.